I haven’t baked this recipe for a long time as I’m no longer vegan, but it satisfied my passion for fruit cake for many years. It’s a rich, dark fruit cake and as long as you choose your marg and stout carefully it’s vegan. Sieve the flour and mixed spice together. Blend the bicarbonate of soda with the 4tbs of soya milk. Mix all the ingredients and beat in a bowl. Poor into a suitable cake tin and bake at gas mark 3, 160°C or 320°F for 2-2½ hours. This entry was posted in Recipes on November 19, 2017 by Chris. This is a deliciously tangy recipe for Christmas pudding that’s both sugar free and, if you pick your beer carefully, vegan. I’ve been making it for many years, since my vegan days, and my whole family rate it as the best Christmas pudding they’ve had. Be warned though, these quantities make a lot. That’s why I’m not actually making one this year—I’ve still got one of last year’s in the cupboard! Mix all the ingredients together. Divide into sensible sized puddings. Roll up each pudding in baking parchment, then wrap in two layers of tin foil. Steam in a pressure cooker at full pressure for at least 1 hour. Reheat by steaming in a pressure cooker for 15-20 minutes. To serve, poor warmed brandy over the pudding and set light to it. 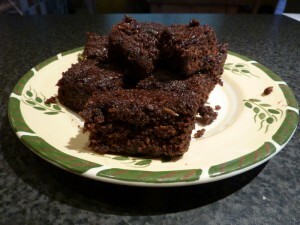 This entry was posted in Recipes and tagged christmas, pudding, recipe, vegan on December 12, 2010 by Chris. Cream the butter and sugar together. Add the beaten egg. Mix the bicarb in with the milk and add. Add the remaining ingredients and mix well. Warming the treacle first makes things a lot easier (sit the tin in some hot water). Pour the mixture into square tins 2″ deep, lined with greaseproof paper. Bake in a slow oven (ie maximum of 150°C/300°F/gas mark 2) for about 1 hour. This entry was posted in Recipes and tagged ginger parkin, halloween, parkin, recipe, samhain on October 30, 2010 by Chris. We bottled up this year’s elderflower cordial yesterday. We made quite a lot, pressing back into use the nappy bucket of sloe gin fame. This entry was posted in Recipes and tagged cordial, elder, elder flower, elderflower on June 9, 2010 by Chris. 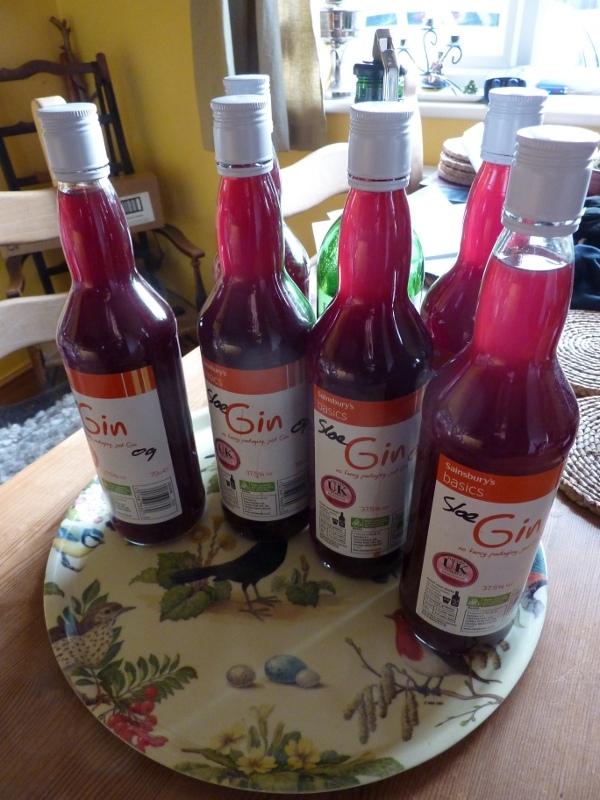 We bottled last autumn’s sloe gin today. I’m sitting with a glass now and it’s absolutely delicious. The recipe has kind of evolved as we’ve sampled it along the way and added extra bits here and there, but I think we’ve kept a note of all the additions. Here’s what I reckon went into it. Most recipes for sloe gin involve adding a few sloes and a bit of sugar to half a bottle of gin. I can’t be doing with such tinkering. Our sloe gin was made in a 10l nappy bucket specially bought from Mothercare. Pick your sloes in October or November. Rinse them and cut a slit in each one. Add to a large bucket with lid. Poor on 6 bottles of gin. Add the sugar. You may want to hold back some sugar and test as you go—adding more later is easy enough. Agitate or stir daily for a couple of weeks, then weekly after that. At first not all the sugar will dissolve, but it will after a week or two. Leave until about February. Then strain through muslin into another large container. Add the seventh bottle of gin to the sloes, rinse them well with it and strain into the rest. 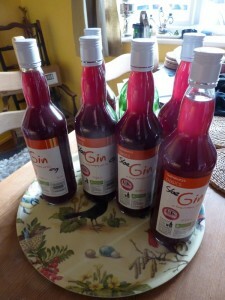 This entry was posted in Recipes and tagged autumn, gin, recipe, sloe, sloe gin on February 14, 2010 by Chris. This entry was posted in Recipes and tagged marmalade, preserves, recipe, seville oranges on January 12, 2010 by Chris.